fruitybeauty - Strike a file. HOW terrifyingly irritating is it, to have a stupid, inappropriate jagged nail and NO NAIL FILE. You try nibbling it off. You try running it up and down your jeans. You even try using a buffer, even though you know it won't do anything more than make the edge of your jagged naughty bit shiny. Grab some matches, fruits. You'll be needing a cigarette to get you through this one. Hang on. That's not what I meant to write. Grab some matches because you can file a nail on the side you strike the match. 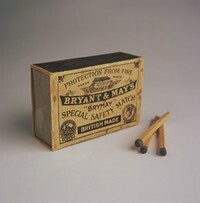 This is assuming you'll have more access to matches than a nail file, obviously. (Hotels and bars always have them, don't forget.) Which would ring true, I think, for most places. Except for maybe these places, in which case, this is a reminder to always carry around a nail file, because the chances of them having a box of Redheads is slim to none.